Long-term relationships are difficult to keep fresh and interesting. I’ve been married for decades, so I know what I’m talking about. Restaurants have an even bigger challenge. How do they manage to stay attractive and in demand, when the next hot thing is right around the corner? Daikaya, the Japanese restaurant from Daisuke Utagawa, Yama Jewayni, and Chef Katsua Fukushima opened in Chinatown in early 2013. They don’t need to worry about getting replaced by a younger model. It’s still a popular restaurant, worthy of the attention and accolades it receives. One of the qualities that makes Daikaya so appealing is its dual personality. It serves as a sought-after destination for ramen downstairs and as a captivating izakaya upstairs. 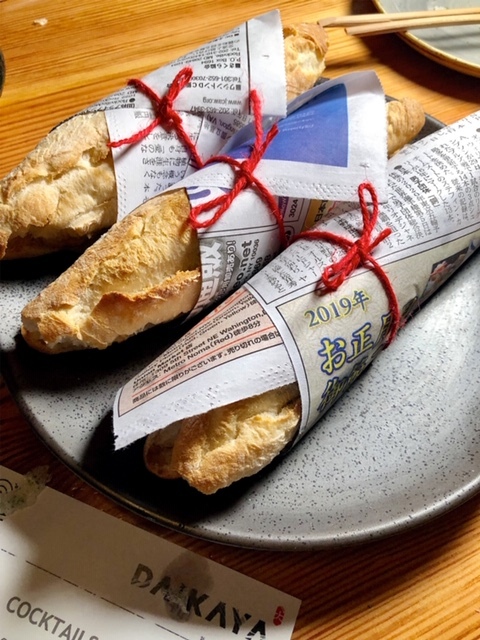 In Japan an izakaya is a casual pub, where patrons can relax, share small plates, and drink. Drinking is key. 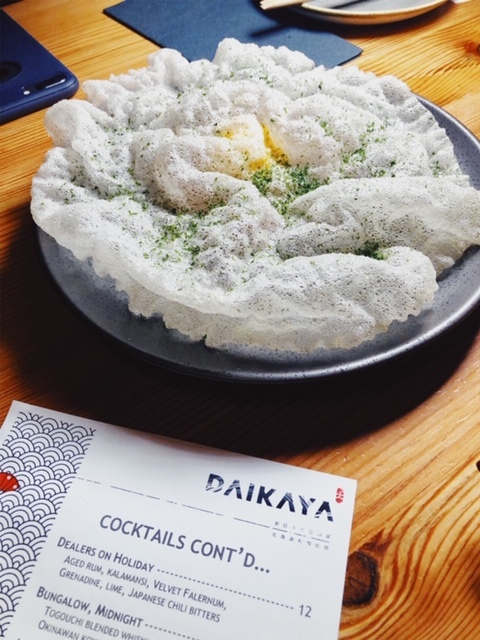 Daikaya creates buzz by switching things up every now and again. The menu at the izakaya was recently updated, and Beverage Director Monica Lee is stirring up intriguing new cocktails. Don’t sleep on “Dealers on Holiday” with aged rum, Kalamansi, Velvet Falernum, grenadine, lime and Japanese chili bitters. It’s an eye-opening libation. It’s also hard to resist “The War on Terroir” with Bolivian brandy, rainwater madeira, lime, and red wine float. There is more to this drink than it’s play-on-words name. The new menu sizzles with dishes that show off the work of a bold chef. 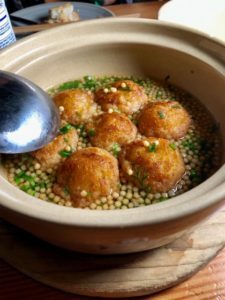 Katsua doesn’t shy away from flavor combinations and cuisine mash-ups that aren’t always intuitive. What to make of burrata with nori puree on grilled bread? Or Cacio e pepe udon? And what is grilled liver with sumac doing here? The menu is a hoot with running commentary accompanying the dish descriptions. This one is the tell-all: Katsuya has never strayed from a challenge, especially the stigma of no cheese w/seafood. One must simply dig into the food to understand that the complexities and twists and turns are what makes Daikaya personable and downright gush-worthy. 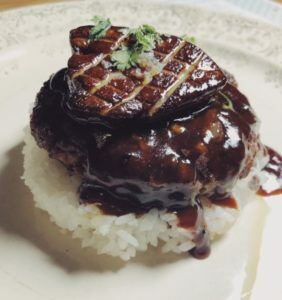 Hambagu- a Japanese hamburger likened to Salisbury steak is uplifted, and then some, by foie gras and black truffle demi glace. 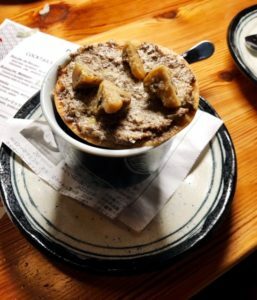 Umami takes center stage with chanwanmushi, a steamed egg custard distinguished by shiitake truffle sauce and parmigiano reggiano. It’s hard to imagine what grilled hotate might be. My off-the-top-of-my-head guess is some kind of potato, but that’s just wrong. 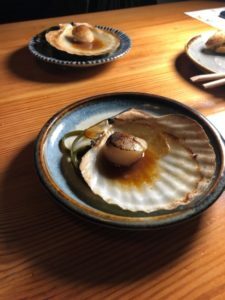 Hotate is a Japanese scallop. It’s simply served with apple juice, soy sauce, and butter…so arresting from its perch on a shell. A perfect bite. Is a tuna sando worth eating when there are so many enticing options available? The menu shines a light on its ingredients: canned tuna, with Bonita del Norte, kewpie mayo, shichimi spice mixture, and pickled cucumber. You can’t judge a dish by its wrapper. Share this with your dining companions and don’t look back. Have we had enough of tuna poke? Perhaps, but Daikaya’s version is extra special. The tuna hides behind a mammoth fried rice wafer with an egg yolk slyly poking through its middle. Also irresistible is Takoyaki in Dashi. Octopus dumplings swim in dashi broth, dressed up for the occasion in crispy rice pearls. And talk about a cheap date! Most dishes on the izakaya dinner menu range between $8-$10. The hambugu tops out at $16, but foi gras…. Whether you’ve had casual dalliances with Daikaya or a more meaningful relationship on occasion, new offerings merit a return. It’s time to deepen the commitment.